The following articles were printed in local newspapers and online. ELYRIA — Lorain County’s population is getting older, according to data from the U.S. Census Bureau. Famed children’s author Stephanie Tolan visited fifth- and sixth-graders at Amherst’s Nord Middle School after the annual Young Authors' Conference. The Lorain County Early Learning Center has given students many activities this week to celebrate Earth Day. The Morning Journal article. 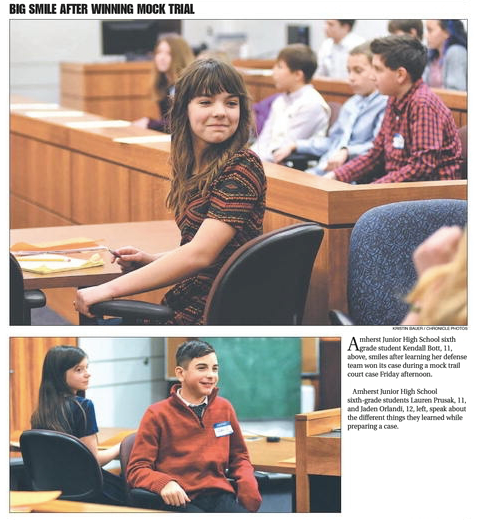 3/4/16 - AVON — It was a battle between two seventh-graders at the end of the preliminary round of the 33rd annual spelling bee Friday at Avon Middle School. Educational Service Center of Lorain County stepped up as a first ESC in Ohio to embrace financial transparency through OhioCheckbook.com. The gifted students from seven schools enjoyed another successful Mock Trial on Dec. 15th at the Lorain County Justice Center. Read the following articles from Sun News (click "More" under the other article photos to continue), The Morning Journal and Amherst News-Times. Real-life attorneys are busy preparing students for the Educational Service Center of Lorain County’s annual mock trial Dec. 15. Attorney Joseph Falbo talks to sixth-graders about the benefits of being in his field. vegetables Thursday. The kids read from the book “Stone Soup” and presented a play, then had soup with their parents. “Stone Soup” is a folk story in which hungry strangers trick a town’s residents into sharing food. The board will work with the Educational Service Center of Lorain County to hire a new treasurer with the position being posted today. “My hope is the board will make their selection and have someone to start in the position sometime in November so there is some overlap,” McCracken said. Using their newly learned skill of sewing, eight Girl Scouts from Junior Troop 50652 spent an hour Tuesday night sewing together pieces of gently used sweaters. The end result was pairs of mittens that will warm the hands of the homeless of Lorain County. Avon students use logic, other skills to solve lunchbox theft class project. “Anti-Virus” is paid for by the Educational Service Center of Lorain County and offered to Amherst students at no cost. AJHS is one of only two schools countywide to try it out. Current seventh-grade student, Kylie Lawson, was recently presented with the 2015 Young Author Award during a meeting of the Amherst Exempted Village Board of Education.